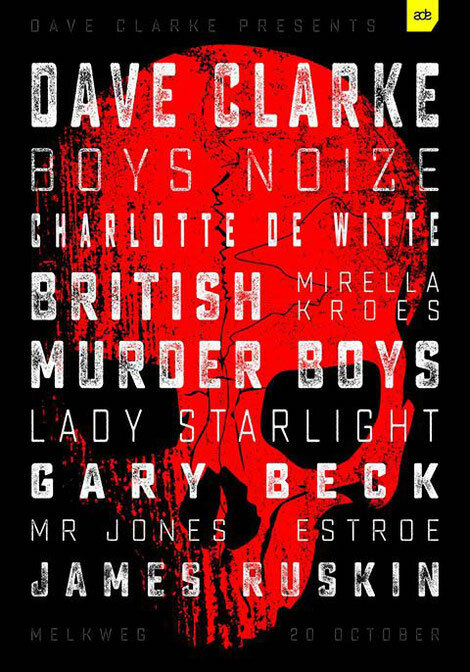 Dave Clarke Presents will be back at ADE 2017 for its 13th edition with a line-up featuring Boys Noize, Gary Beck, James Ruskin, the comeback of British Murder Boys (Regis & Surgeon), a performance by Lady Starlight and some of the low countries artists including Estroe, Mirella Kroes, Charlotte de Witte and Mr. Jones. Headlining this edition is DJ/producer/label boss Alexander Ridha aka Boys Noize, who merges various styles with influences of hip-hop and disco roots as well as heavy noise and electro house sounds. Next up is the return of British Muder Boys, the sideproject of Regis and Surgeon with their brand of techno in a punk ethos. An ideal fit for the American performance artist Lady Starlight, who’s worked before with Surgeon. Fans of techno will be happy to see the return of Gary Beck. The Scottish DJ/producer has released productions on labels including Cocoon and Saved, with his latest release ‘Famoo Funk’, receiving support from Clarke’s own ‘White Noise’ show and BBC Radio 1. Also appearing is James Ruskin, the Blueprint label boss who is responsible for some of Surgeon, Lakker and Samuel Gerridge’s best tracks. As a DJ/producer, he reinvents himself, whether it’s his solo tracks, or the collabs he does with Mark Broom or Regis as O/V/R. Charlotte de Witte is also on the line-up. The Flemish DJ/producer found herself embraced by the techno scene in a very short amount of time, largely thanks to her love for the darker side of techno. The line-up is completed by Dutch techno veterans Mirella Kroes, Estroe and Clarke’s studio buddy Mr. Jones.